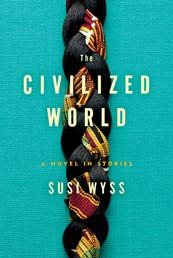 Henry Holt is proud to present the stunning literary debut from Susi Wyss: The Civilized World. Set in Africa, the novel follows five women as their lives intertwine in surprising and even explosives ways. When Adjoa leaves Ghana to find work in the Ivory Coast, she hopes that one day she'll return home to open a beauty parlor. Her dream comes true, though not before she suffers a devastating loss—one that will haunt her for years, and one that also deeply affects Janice, an American aid worker who no longer feels she has a place to call home. But the bustling Precious Brother Salon is not just the "cleanest, friendliest, and most welcoming in the city." It's also where locals catch up on their gossip; where Comfort, an imperious busybody, can complain about her American daughter-in-law, Linda; and where Adjoa can get a fresh start on life—or so she thinks, until Janice moves to Ghana and unexpectedly stumbles upon the salon. The Civilized World is a deeply moving novel that “beautifully and effortlessly captures the essence of human connection” (Library Journal). What did I think? I like reading books about women who live in different cultures and settings than I do. Some of my more favorite reads over the last little while have been exactly that. This is no exception as it takes place mainly in Africa and is about women who want essentially the same things as I do, but get these things in different ways. I really liked the characters and found myself thinking about the story after I'd finished reading it - a sure sign of a good read or was it that the author was a little vague in places? She hinted at something meaningful that I didn't always quite catch, which may say something about my own literary prowess or a lack of details, I'm not quite sure which one. At any rate, I enjoyed reading this book and had no issue finishing it quickly. The well developed characters were a joy go get to know. And this story, which focused on women's lives and not just about romance and getting the man, was refreshing and interesting. Thanks to Henry Holt for sending me a copy of this book in exchange for an impartial review. I LOVE being asked to review books-- I have found myself reading things lately that I would never have picked out on my own. This one sound pretty interesting, thanks for the review! I'm a faithful reader of your blog, and have seen that you've been silent for quite some time. I hope and pray that all is well with you and your family. I pray that you are experiencing God's love and blessings in new, tangible ways. And if you're in a desert, I ask that through this leg of your journey you would be provided for in every way, and come out of it a more beautiful and refined follower of Christ. You are a wife, mother, daughter, and and ultimately a warrior child of God! Be blessed dear sister and know that He has gone before you and the war is won. Rest in Him. Much love to you and yours.